UPDATE: Since this post went up, GoldFynch has moved to a new and improved advanced search system. Find out about its features and how it works and how to search for specific file types. With our most recent update to GoldFynch, the ability to search by file extension has been added! In addition, improvements have been made to filetype searching. Typing an extension that matches documents in your case will prompt you with an extension search suggestion. Multiple extensions can be specified by entering a comma separated list. Only valid extensions that match documents in your case will yield suggestions. Search suggestions have also been added for filetypes. Filetypes may include a range of different file extensions. In the broadest sense, searches can be made for a general category of items. These general categories are: Image, Audio, Text, Video, Archive, Email, Email Collection, Word, Excel, Powerpoint, iWork. Each of these categories also contains multiple sub types (e.g. image contains png, jpg, gif, etc.) which can also be used to initiate a filetype search. Advanced users will also appreciate the ability to search directly by MIME types. Once again, search suggestions for a filetype will only appear if items of that filetype exist in your case. Finally, a mix of general filetypes, specific filetypes, and MIME types can be used together. 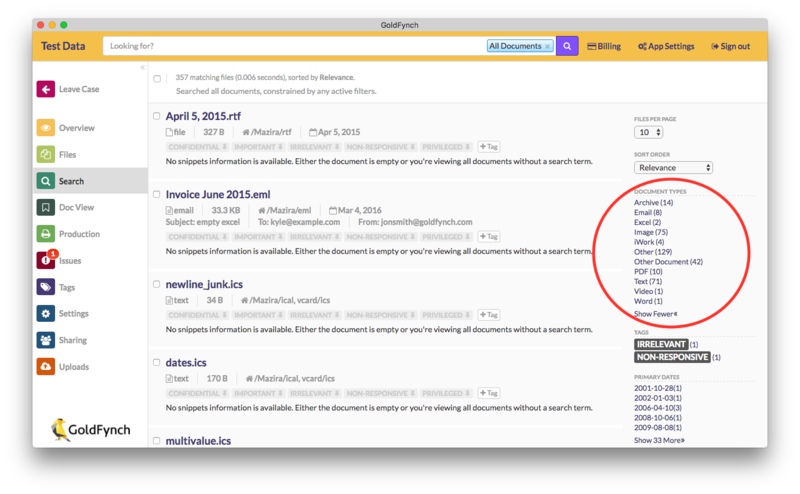 Users who wish to have further control over filetype and extension searches can now use negated search queries. By appending a “ !” (read as “not”) to a query, GoldFynch will suggest a search of all items but NOT those beginning with the “ !”. For example, a search of !image will return all items that are not images. This negation can be applied to both file extensions and all levels of filetypes (including MIME types). A combination of negated and normal queries is also possible with filetype searches. Also, remember that filetype search filters with items counts are visible in the righthand pane of the search results page. These filters can be applied with a simple click. With these new changes, searching in large data sets should be much easier! Let us know if you have any questions or would like to see further filetypes added.